The Schacht Cricket Loom is compact, capable, and cute! 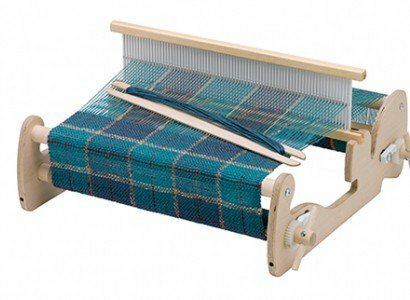 This is a fully functional rigid heddle loom in a portable design, great for travel and crafting remotely with friends. This 15 inch version is made of high-quality, unfinished apple plywood and hard maple, and it includes everything you need to get started! Each loom comes with an 8-dent reed (sorry, no substitutions), a threading hook, warping peg, table clamps, two shuttles, and two balls of yarn. Extra accessories for the 15 inch Cricket are also available. You'll find the Schacht 15 inch Cricket loom is great for children and grown-ups alike, and it is still compact enough to take with you easily. The 15 inch weaving width offers more flexibility in your choice of weaving projects. In 2010 this loom was redesigned, adding the ratcheting mechanism to the outside of the frame to increase the weaving width. This also allows the tension to be adjusted much easier during setup and weaving. The Cricket series looms are a great way to get started weaving. Don't let their small size fool you! These looms are fun and versatile to use, and all Schacht looms are made with pride in the USA with high quality craftsmanship and materials in Boulder, Colorado. These portable looms are great for teaching weaving classes for adults and children. They are fairly simple to setup and are small and inexpensive enough that students can take the looms home between classes. The Schacht Cricket was a craft finalist in the prestigious 2014 Martha Stewart American Made Awards. When you purchase a Schacht loom you know you're getting a well-designed tool built by craftsman who are dedicated to weaving.